Perched on the park’s highest peak, Wild Eagle rises 21 stories into the sky. Taking off from the Wilderness Pass area, riders experience the sensation of flight as the coaster’s massive track swoops and soars along a journey that measures 3,127 feet. Wild Eagle reaches a top speed of 61 miles per hour and maneuvers four inversions including a giant loop, a “zero-G” roll, and a giant flat spin. Wild Eagle’s nearly two-and-a-half minute journey includes a plummeting 135-foot first drop. Located 210 feet above the coaster’s loading station, the ride provides spectacular views of the Smoky Mountains terrain below. Each coaster train consists of seven cars which carry four passengers for a total of 28 people per train. Each vehicle features an imposing bald eagle with piercing eyes and broad wings outstretched for flight. Wild Eagle is the largest single capital investment in Dollywood’s 26-year history. The park’s development team is collaborating with Switzerland-based Bolliger & Mabillard (B&M), the world’s premier coaster manufacturer. Pioneers in ride technology, B&M has built 11 of the 20 highest-ranking steel coasters in the world, according to Amusement Today magazine. The ride’s name celebrates the bald eagle, a raptor whose population has increased in recent years due largely to the efforts of the American Eagle Foundation (AEF). Headquartered at Dollywood for 20 years, the AEF is home to Eagle Mountain Sanctuary, a 1.5-million-cubic-foot natural outdoor aviary with the largest presentation of non-releasable bald eagles. Dollywood is one of the AEF’s largest benefactors, supporting the not-for-profit organization’s work to preserve and protect birds of prey. Finally, we have the super-massive Wing-Rider we’ve been waiting for. 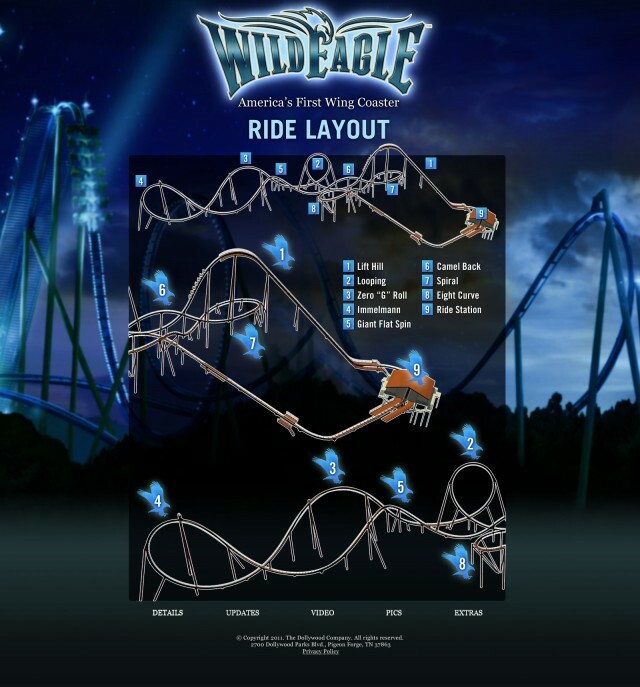 While it does not have the unique-to-wing rider elements that will be featured on X-Flight at Six Flags Great America and The Swarm at Thorpe Park, Wild Eagle will no doubt be a spectacular experience. What this Wing-Rider has the other two don’t: location, location, location. Being perched amongst the Smokey Mountains, when the train crawls past the tree line on the lift hill, it will offer an unbelievable view that no other Wing-Rider has even come close to seeing. Plus, with nothing above or below you, it will by far give the best sensation of flight soaring and through the trees. Returning the to the topic of the layout, it is interesting to note that nothing on Wild Eagle that screams Wing-Rider. No long-drawn out inline twists, or diving first drop, but instead a rather normal layout with the winged seats as an added bonus. Which makes me wonder if this was originally planned to have a different seating style. 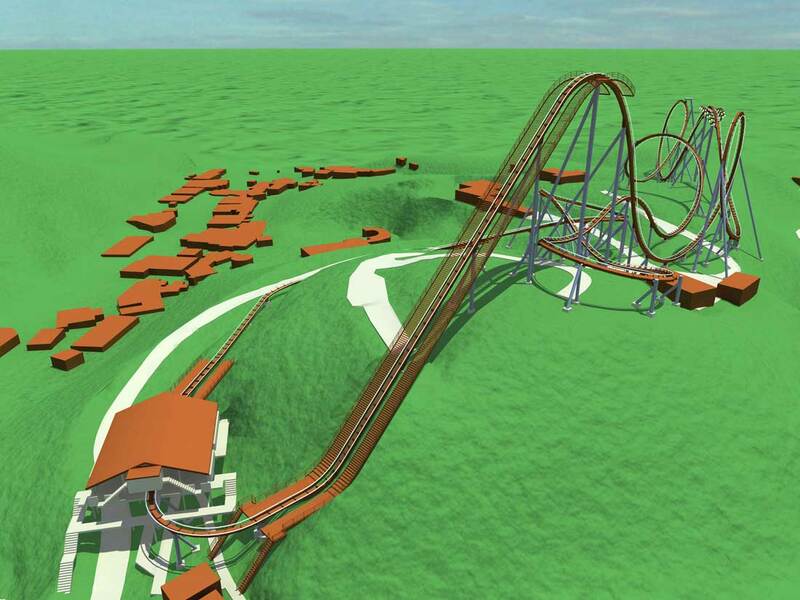 The ride does seem to resemble Wildfire from Dollywood’s sister park, Silver Dollar City. I would not be surprised if some time during the planning process, the decision was made to change the trains to the current ones as they would create a more unique, and hopefully better experience. However, there is really nothing to complain about. The sheer size alone makes this, by my opinion, the best Wing-Rider yet. AWing-Rider on a mountain! It’s hard not be amazing with a coaster style and location like that. I continue to be increasingly pleased with how much success Bolliger & Mabillard is having with their new style. Don’t wouldn’t be surprised if we see 3 more pop up next year.